The project on the First World War that earned West Ham United a place at last weekend's Premier League Truce Tournament finals in Ypres, Belgium, not only gave a valuable history lesson to the club's Under-12s. 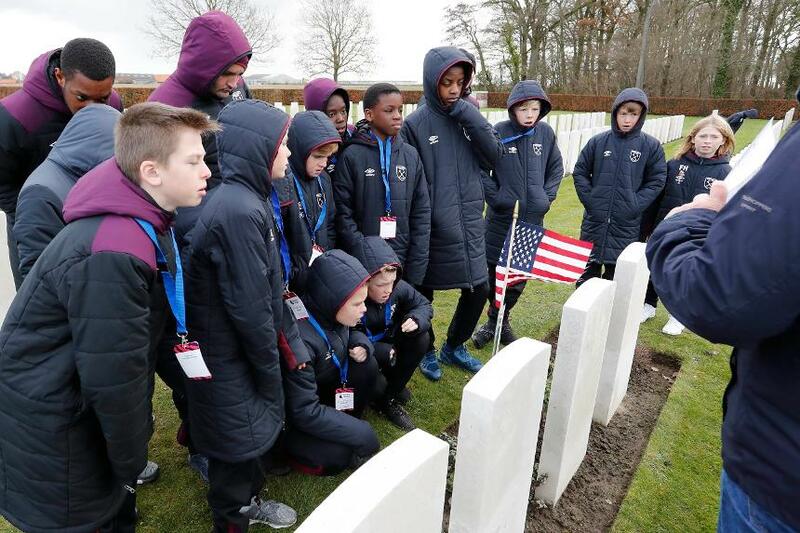 The assignment and the whole experience in Ypres gave the boys life skills that will serve them well in their future, in football or outside the game, according to West Ham Head of Education, Oli Lethbridge. "The boys all come from different primary and secondary schools, where they had different experiences of learning about the First World War," says Lethbridge. "Some might have learned about the Battle of Somme; others learned about how the First World War started. "But it allowed all of them to develop their knowledge of what happened at the First World War." 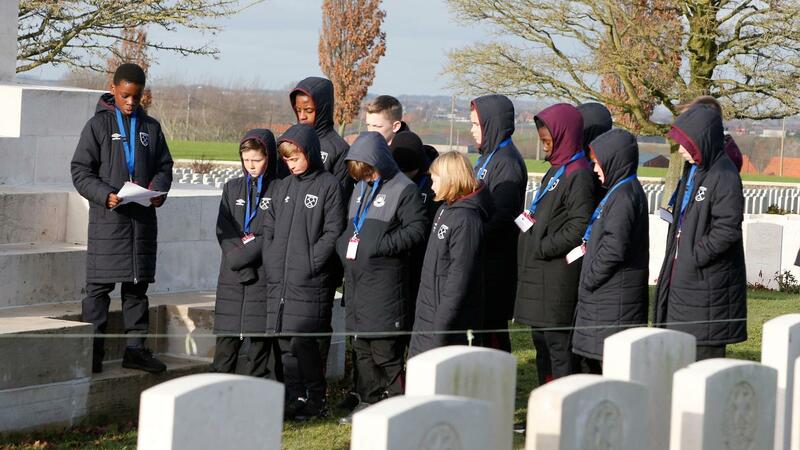 The West Ham boys' project raised awareness of soldiers who lost their lives in the Battle of Passchendaele in 1917 and were buried in cemeteries local to their club. They put on a Remembrance Service, wrote poems and letters and produced a video that was viewed over 200,000 times on the club's social media platforms. "The main thing they would have taken away, not just from the video but also the Remembrance service they organised, was how important it is to remember the sacrifice many young soldiers made," Lethbridge says. The fruits of their hard work were a place in the Truce Tournament in Ypres last weekend. It was also an educational experience. They visited trenches, memorials and cemeteries as they learned about the soldiers who sacrificed their lives in the First World War. They visited the Passchendaele 2017 Memorial Museum, 100 years on from the battle they raised awareness for in their project. The benefits of the project on the boys went beyond education, providing an important experience that will serve them well during their progress through the Academy. "The boys started to understand the importance of how to conduct themselves within different environments, so, for instance, some of them going to the cemetery might have been a new experience," Lethbridge says. "Being asked to contribute something to the community will have been a fairly new experience for them, and one that as they go through the pathway at the club will obviously become more and more important. "They will end up being role models to fans, young people, people that aspire to be in the same position as them." All clubs have a role to play within their local community and this project helped the U12s make an early connection with people from the area and other parts of the club. "The challenges were trying to connect with the local community, trying to get their involvement in the project to raise awareness for the Battle of Passchendaele, which, as well as remembering, was also the main part of the project, to get others to remember and to get others to learn about this particular battle," Lethbridge says. "They did that by connecting with local fan groups, by inviting Academy staff." The video that showcased their project also helped to communicate their message to an audience beyond their community and gave the boys valuable experience of the power that this form of communication can have for them and the club. "They had the challenge of sharing our video, the video they produced, as much as possible," Lethbridge says. "It was put on Twitter, Facebook and the website. After the first day they had got 200,000 people to watch it, which was more than we ever thought possible."